Dr. Robert Locke will be stepping down as Editor in Chief of PULSE following 12 years of service. 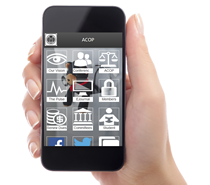 His expertise, vision and attention to detail have been highly valued as ACOP has moved from print to the digital age. Dr. Locke began his work with the Fall 2004 issue of PULSE, serving as Associate Editor with Gregory Garvin, DO, FACOP until the Spring 2007 issue. Dr. This will be my final President’s Message. This April, Ed Packer, DO, FACOP will assume that responsibility. It has been an honor to serve the ACOP these past two years. 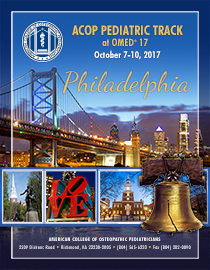 We have opened many doors with our ongoing goal of standing strong in support of osteopathic pediatricians. My regular readers will recall that several of my columns talked about grandparents. I don’t know the source of this whimsical piece but for those of you who deal with grandparents (and who doesn’t? ), this should bring a smile to your faces. When tackling the overwhelming epidemic of obesity in children, there are some simple tactics that can keep the primary care pediatrician focused and will hopefully have some benefit. ACOP welcomes news of our members' contributions to journals and other scholarly publications. Please contact the PULSE Editor to share your accomplishments with your fellow members. To find out who has recently been published, click here. It was Friday at 4:30 pm when we received the call of another patient being admitted to the floor. It was a six-year-old girl with severe abdominal pain and elevated serum lipase. We brought her to the inpatient unit and performed the usual management for acute pancreatitis. Some children need more than medical care. They need a voice. Children, like a young boy receiving illicit drugs from his father, or a newborn whose mother shows signs of intellectual disability, or a child whose parent who sells the child’s Adderall, except for a few pills given prior to an appointment—just enough to pass a urine toxicology screen.